The Oscar statuette is pretty heavy. When the 90th Academy Awards are handed out on Sunday, it's inevitable that at least one first-time winner will comment on just how heavy the statues are. And it's no wonder, because the Oscar is pretty hefty in size. According to the Academy's website, the Oscar weighs in at 8.5 pounds and stands 13.5 inches tall. The statuettes are made of solid bronze and plated in 24-karat gold. In total, it takes three months to create 50 of them. A view of oscar statuettes backstage during the 89th Annual Academy Awards at Hollywood &amp; Highland Center on February 26, 2017 in Hollywood, California. However, there was a three year stretch during World War II that the awards were actually made of painted plaster, due to a metal shortage. On its website, the Academy explains that after the war it "invited recipients to redeem the plaster figures for gold-plated metal ones." 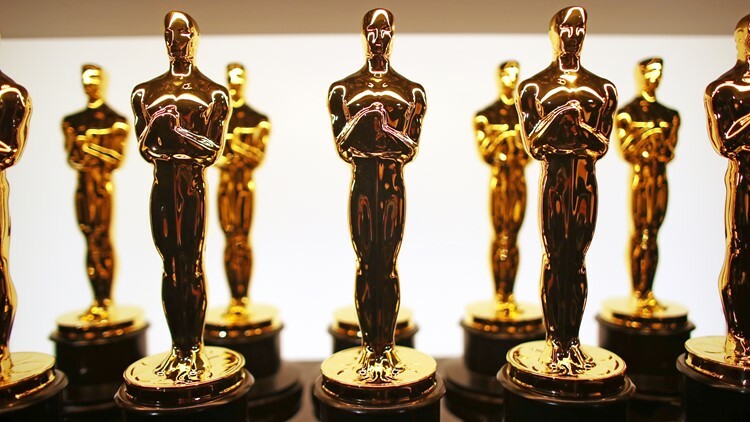 In comparison, the Oscar is heavier than each of the awards for the Primetime Emmys, Grammys, Tonys, and Golden Globes. Emmy Award: Each Primetime Emmy statuette weighs six pounds, twelve ounces, and is made of copper, nickel, silver and gold. The Emmy statuette for regional awards weighs three pounds, five ounces. DON EMMERT/Getty Images, This content is subject to copyright. The new 2009 Golden Globe statuettes are on display during an unveiling by the Hollywood Foreign Press Association at the Beverly Hilton Hotel on January 6, 2009 in Beverly Hills, California. NEW YORK, NY - JUNE 11: A view of an award being held in the press room during the 2017 Tony Awards at 3 West Club on June 11, 2017 in New York City.